Thoughts on the intersection of race, religion, politics, ministry, sports and culture. A new study from the Barna Research Group examines the involvement of church members across the country. The research explores the lives of active participants in the faith and how their faith is lived out in small group participation beyond large-group worship services. 1. Women drive most faith participation, with the exception of home churches or house churches. 2. Religious activities are typically missing single adults, especially those who have never been married. 3. Older adults also dominate faith involvement. 4. Regionally, Americans’ faith involvement falls along stereotypical lines. 5. Catholics are not particularly active beyond worship attendance, while evangelicals participate in many different forms of "group faith." 6. Attenders of larger churches involve themselves in the broadest spectrum of faith activities. 7. African-Americans represent a significant share of those involved in participatory faith. 8. Personal Bible reading is most common among small group attenders. 9. Many religiously active Americans lean toward conservative political views, though there is more diversity than expected – especially among house church attenders. To read a more complete synopsis on the report click here. "We are familiar with this term in many ways, from having a "grace" period when we don’t mail the check in on time, to hearing it in hymns or descriptions of exceptional people. The usage that I like the best is a theological one with the definition "unmerited favor." Grace is when we extend "favor" to someone, not because they have earned it in some way, but because we just possess it to give. It is a stance in life, a way of being. A "person of grace" is one who does the things we have described above of being "for" and not "against," and treating others in the way that she would want to be treated. It makes for ultimate trust. So, if you want to leave the best wake possible, leave behind a trail of people who have experienced your being "for them." I heard a man describe his boss one time this way: "She was a tough one, but I always felt she wanted me to do well. She wanted me to win, even when she was hard on me." People of grace leave others better off than how they found them, even when they were getting nothing in return." Help My Friend Show Oprah How it's Done! A good friend of ours, Shanera Williamson, is hoping to become the host on a new reality show that will be on Oprah Winfrey's new network. Her desire is to tell uplifting stories about real people that might be an inspiration to others. As a multi-talented woman, Shanera is hoping to let her light shine on a platform being provided by one of the world's greatest influencers. In order to help Shanera win the competition please go to this link on Oprah's page to watch her audition video and vote. You can vote more than once so please come back and spread the world by sharing the following link with your friends. Thanks! For my birthday earlier this year my wife gave me a copy of Mike Greenberg and Mike Golic's book, Mike and Mike's Rules for Sports and Life. Greeny and Golic are hosts of the popular ESPN Radio morning show, Mike and Mike in the Morning, a show I often listen to on my way into the office each day. I was reading a section from the book this afternoon when I came across a story from Mike Greenberg about an encounter that he once had with Lou Holtz, the well-known football coach and now analyst. With today being Father's Day, I thought it was especially poignant. "The first time I met Lou Holtz, we taped a SportsCenter segment together. Afterward, we were walking down the hall on our way out of the studio. Holtz walks very fast, and I'm chasing just to keep up with him, trying to make any small talk that comes to mind. Out of nowhere, Holtz stops and turns to me. "How many kids you got?" he asks. "I have two," I tell him, a little surprised. "They're, you know, little kids." He looks me straight in the eye. "The best thing you can do for them? Make sure that, every day, they know how much you love their mother." And with that, Lou Holtz walked down the hall and out the door." I'm sure Lou Holtz heard those words from someone else (Theodore Hesburgh, the former president of Notre Dame is said to have originated the quote) but that doesn't make them any less powerful. As a husband and father, when I love my wife well then I love my kids well. In doing some research recently on Historically Black Colleges and Universities (HBCU's) I learned some interesting facts about these institutions of higher learning. HBCU's are considered to be those schools that were founded before 1964 in order to meet the needs of African American students seeking higher education. But even after the Civil Rights Act of 1964, these schools continue to provide a good educational option of students of African descent and those of other ethnicities wishing to receiver higher education. • HBCU’s represent 3% of the nation’s institutions of higher learning and enroll 12% of the nation's African American students. There are 370,000 African American students that attend the nation’s 105 HBCU’s. • HBCU’s comprise 9 of the top 10 schools that produce African American graduates that go onto earn PhD’s. • More than ½ of the nation’s African American public school teachers are HBCU graduates. • 70% of the country’s black physicians and dentists went to an HBCU. • Over half of all African American professionals are HBCU graduates. • Nearly ½ of the members of the Congressional Black Caucus. • HBCU’s award 23% of all bachelor degrees, 13% of all master’s degrees and 20% of professional degrees awarded to African Americans. • Eight out of ten African American federal judges went to an HBCU. • Florida A & M produces more African American graduates each year than any other college in the country. • According to the 2010 rankings by U.S. News & World Report, the top ten HBCU’s in the country are (in order): Spelman, Howard, Morehouse, Fisk, Xavier (LA), Hampton, Tuskegee, Claflin, Dillard, and North Carolina Central. • HBCU alumni include Booker T. Washington, Rosa Parks, A. Phillip Randolph, Mary McLeod Bethune, James Weldon Johnson, Nikki Giovanni, Andrew Young, Thurgood Marshall, Oprah Winfrey, Jesse Jackson, Langston Hughes, Toni Morrison and Martin Luther King, Jr.
For a complete list of HBCU's within the United States, please visit the White House Initiative on Historically Black Colleges and Universities here. "If you've ever driven between Cincinnati and Dayton, Ohio, on I-75 then you probably saw the six-story King of Kings statue featuring Jesus coming out of a lake with hands raised in front of the Solid Rock Church in Monroe, Ohio. Monday night the statue was destroyed by fire after being struck by lightning. The gleaming white statue was unmissable, even speeding down the interstate. Monroe fire chief Mark Neu told the CNN Belief Blog he's never seen anything like the fire in his 32 years as chief. He said the 62-foot statue had a steel frame and was wrapped in Styrofoam and covered with a fiberglass coating to protect it. At 11:16 last night, the fire department got the call the statue had been hit by lighting and was on fire. "It spread from the statue to the amphitheater," he said. "There was heavy damage to the amphitheater where the stature backed up to. It was a fast-moving fire. We’re looking at $700,000 worth of damage." The chief has spoken with church officials, who have gotten calls about the statue today from as far away as China. "I know the membership of the Solid Rock Church was devastated by the fire and have every intention of putting the statue and the amphitheater back as is was," Neu said. "They said they plan on rebuilding immediately and moving forward." Neu said no one was injured in the blaze." Although many American Christians might claim that they agree with the concept of tithing (giving 10% of one's income to God's work), studies show that few actually practice it. Scot McKnight on his Jesus Creed blog reviews the book, What Americans Really Believe, and points out some interesting facts as it pertains to the giving patterns of Americans. Most research indicates that American Christians give approximately 2-3% of their income to their local church and other ministries. So even if many of us say we believe in giving 10% of our income to God, few of us actually live this out. What is most interesting, as McKnight points out, that in most cases the more money a person makes translates into a lower percentage of giving. For example Americans who make less than $10,000 annually give on average 11.2% of their income. On the other hand, those that make over $150,000 give 2.7% of their earnings. The most likely group to tithe? Widows and widowers, who give 20.1% and 16.7%, respectively. There is even some debate in Christian circles about whether tithing is necessary for modern day Christians since it is an Old Testament principle that is not emphasized in the New Testament. The New Testament seems to place a greater importance on the idea of "generous giving" as advocated in I Corinthians 9. But I like the way a former pastor of mine put it. As Christians that seek to have generous hearts, we can look at tithing as training wheels on a bike. It's a good starting place but at some point you want to take the wheels off and go beyond where you've been. For example, a Christian that makes 500 million dollars a year can give a tithe but still not be generous in their heart. A single mom pulling down $17,000/year could give $2,000 and exhibit extreme generosity. It is not for us to compare our giving patterns to others or to judge others based on what they do or don't give. It is up to each of us to approach God with an open and honest heart and give as He directs us. When it comes down to it, I don't think God is so concerned about whether we give 10% or not. I think he's much more concerned with the state of our heart and whether we are sensitive to what he is calling us to do. The topic of tithing becomes a secondary issue when we are primarily concerned with being good stewards. For a great read on the topic of stewardship and giving, I recommend Randy Alcorn's short book, The Treasure Principle. I am taking a seminary class this summer on the subject of Apologetics, which is essentially the defense of the Christian faith through rational thought. I've been reading a number of books and articles in conjunction with the class and one of the authors I've enjoyed the most is Rev. Tim Keller, pastor of Redeemer Presbyterian Church in Manhattan, New York. I appreciate Keller's thoughtful and sincere thinking as it pertains to doubts about the Christian faith and highly recommend his book, The Reason for God: Belief in an Age of Skepticism. I've already quoted him on this blog a couple of times recently but I just finished the chapter entitled, "The Church is Responsible For So Much Injustice," and appreciated Keller's response to this legitimate question. Keller argues that the greatest critique of so-called Christians that have done evil in the name of Christ has not come from those outside the Church but has come directly from Christianity itself. In formulating his response to this question, Keller offers several examples of Christians who actively led in the crusade against the injustices of their day and even gave their lives as a result. "When Martin Luther King, Jr. confronted racism in the white church in the South, he did not call on Southern churches to become more secular. Read his sermons and "Letter from a Birmingham Jail" and see how he argued. He invoked God's moral law and the Scripture. He called white Christians to be more true to their own beliefs and to realize what the Bible really teaches. He did not say "Truth is relative and everyone is free to determine what is right or wrong for them." If everything is relative, there would have been no incentive for white people in the South to give up their power. Rather, Dr. King invoked the prophet Amos, who said, "Let justice roll down like waters, and righteousness as a mighty stream" (Amos 5:24). The greatest champion of justice in our era knew the antidote to racism was not less Christianity but a deeper and truer Christianity." "The famous Lutheran martyr Dietrich Bonhoeffer was pastoring two German-speaking churches in London when Hitler came to power. He refused to stay at a safe distance and returned to his country to head an illegal seminary for the Confessing Church, the Christian congregations that refused to sign an oath of allegiance to the Nazis. Bonhoeffer wrote the classic The Cost of Discipleship, in which he critiqued the religion and church of his day. In echoes of Jesus and the prophets, Bonhoeffer revealed the spiritual deadness and self-satisfied complacency that made it possible for so many to cooperate with Hitler and turn a blind eye to those being systematically marginalized and destroyed by the Nazis. Bonhoeffer was eventually arrested and hanged. In his last letters from prison, Bonhoeffer reveals how his Christian faith gave him the resources to give up everything for the sake of others. Marx argued that if you believe in a life after this one you won't be concerned about making this world a better place. You can also argue the opposite. If this world is all there is, and if the goods of this world are the only love, comfort, and wealth I will ever have, why should I sacrifice them for others? Bonhoeffer, however, had a joy and hope in God that made it possible for him to do what he did." In order for injustice to be addressed, we don't need Christianity to be abolished. What we need are more followers of Jesus that are fully devoted to living as He lived with love, truth, compassion, courage and grace. The Christian faith is not tied to a particular political party or the exclusive property of a specific ethnicity or culture. It is not a hateful, arrogant faith. Jesus himself said that others could tell who His true followers were by the fruit that was produced in their life. And the fruit that he said should be most evident? Love. "As long as American culture embraced so many Christian values, there were few easily observed cultural distinctives connected with being a Christian. As the culture shucks off this heritage, it is becoming more and more important for Christians to live in styles that openly conflict with the culture. Perhaps we will not take a job promotion that would mean more time away from the family; perhaps we will choose a simpler lifestyle in order to give more away to missions and to the poor; perhaps we shall be so committed to elementary Christian discipleship that we shall be largely inured against flattery; perhaps we shall treat old and young, rich and poor, the well-connected and the socially unimportant, with the same degree of dignity and respect - a decidedly Christ-like characteristic. Perhaps we shall be known as people who work at their marriages and love their children without trying to live their lives through them; perhaps we shall be known as people who are disciplined in their use of time, in what they watch on TV, in their freedom to make intelligent and moral judgments precisely because they are thoroughly committed to the living God; perhaps we shall be known as people who like to read, think, and talk about God and about right and wrong." Living in Central Florida is great in many ways but our interactions with nature and wildlife can make this an adventurous place to live. The prospect of hurricanes each summer and fall weighs heavily on each of us and you never know when you're going to step on a fire ant mound or come across an armadillo or a bear rummaging for food. But one of the most dangerous things about living in Florida is the presence of alligators. You could encounter one in the most unlikely of places and always need to be especially careful when near lakes, ponds and rivers. Some kids at a middle school in Tampa learned this the hard way the other day. 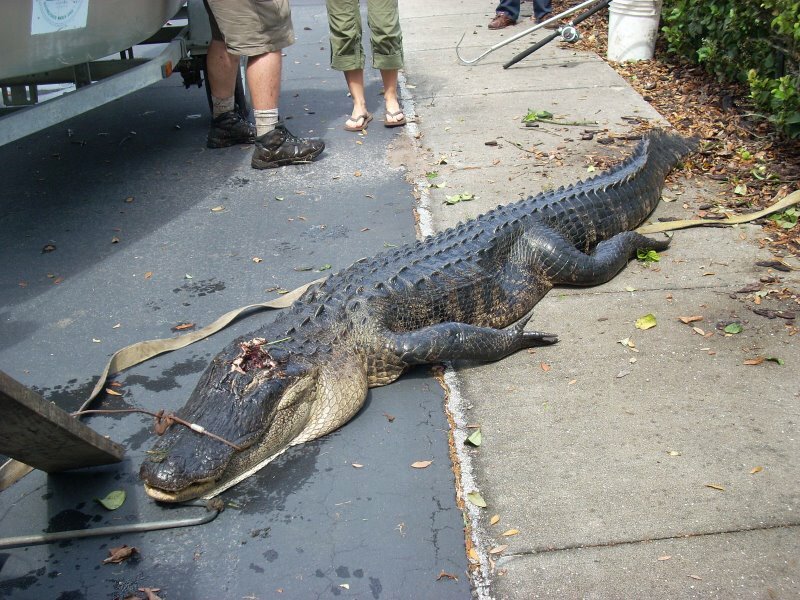 "Preliminary reports suggested the gator somehow crawled inside the school during the weekend. But Gary Morse, a spokesman for the Florida Fish and Wildlife Conservation Commission says that, in reality, a custodian let the alligator inside early Monday morning. "The alligator was found between the parking lot and the cafeteria, and the custodian let the gator inside," Morse said. "I understand his thought process -- he thought it would be easier to apprehend if it were in a contained area, but that just makes it worse. "When an alligator is confined, it feels far more threatened. Ever try to get a dog out of a cage when it's unsure of its surroundings?" Alligator sightings are not unusual in Florida, according to Hillsborough County School District spokesman Steve Hegarty. "Florida has lots of gators," he said. "If you're a Floridian, you will run into one." Fortunately, no children or teachers were hurt but they probably should have a little sit-down with the janitor and explain how to handle gators in the future. "For the one who suffers, the Christian faith provides as a resource not just its teaching on the Cross but also the fact of the resurrection. The Bible teaches that the future is not an immaterial "paradise" but a new heaven and a new earth. In Revelation 21, we do not see human beings being taken out of this world into heaven, but rather heaven coming down and cleansing, renewing, and perfecting this material world. The secular view of things, of course, sees no future restoration after death or history. And Eastern religions believe we lost our individuality and return to the great All-soul, so our material lives in their world are gone forever. Even religions that believe in a heavenly paradise consider it a consolation for the losses and pain of this life and all the joys that might have been. The Biblical view of things is resurrection - not a future that is just a consolation for the life we never had but a restoration of the life you always wanted. This means that every horrible thing that ever happened will not only be undone and repaired but will in some way make the eventual glory and joy even greater." How Should Christians View Immigration Reform? In the wake of the passing of Arizona's recent immigration reform law, there has been an increased dialogue about how the rest of the country should handle immigration reform. Predictably, many conservatives favor tougher laws while liberals argue for a "kinder, gentler" approach to handling visitors from other countries. "The Hebrew Bible mentions obligations to so-called strangers on numerous occasions. The message is pretty much always the same and perhaps best summed up by the words of Leviticus 19:33-34: "When a stranger dwells among you in your land, do not taunt him. The stranger who dwells with you shall be like a native among you, and you shall love him like yourself, for you were aliens in the land of Egypt--I am the Lord, your God." But who that stranger is that deserves such equality and even love is not necessarily a parallel to the millions of people who cross our borders illegally every year. Or perhaps it is. The stranger of the Hebrew Bible is better understood as a resident alien, a non-citizen who agrees to abide by the laws of the community into which he or she has come. To that extent then, many if not most, illegal aliens in this country, would not qualify. On the other hand, there is no mention in the Bible of barriers to entry into the Israelite nation, so perhaps they do. What seems clear from Scripture (that itself a complex claim) is that loose borders or barriers to entry are only reasonable if accompanied by quite strict rules about participation once having arrived in the new community. That means that neither side in the current debate really understands what the Hebrew Bible intended. Conservatives, generally obsessed with the "inappropriateness of rewarding illegal immigrants with any of the benefits of American life", miss the fact that how someone came to join the Israelites had no bearing on their status within the community once they arrived. There really was a sense of community as sanctuary - precisely what those taking a hard line on immigration oppose. Liberals, however, are just as wrong when insisting that biblical hospitality knows no bounds and asks no questions - that it was an unqualified right with no attached obligations. In fact, like all ancient sanctuaries, there were many rules to be followed and norms to be upheld. In other words, entry was open to all, and once in they were treated as equals, but demands were made and failing to meet those demands was grounds for exclusion from the community. While other biblical texts and traditions could be introduced into the debate on immigration, based on those verses bearing directly on the issue, the path forward is actually pretty clear: how one got here is largely irrelevant, though the obligations that must be assumed in order to stay are significant. Biblical "immigration policy" was not about maintaining the purity of the community or fear of withholding the benefits of membership, but it was quite clear about the obligations that needed to be met to enjoy the privileges (not rights) of such membership. It would be quite a step forward to see people actually look to that model for guidance instead of simply thumping their Bibles to prove that which they already believe anyway." Rabbi Hirschfield presents a balanced perspective on how the Bible addresses the treatment of strangers in the land of Israel and provides some principles that would be wise for us to apply. Since we live in a country primarily made up of immigrants and the descendants of immigrants, it is important for us to remember that many of our ancestors, too, came to this country looking for a better life for their children and grandchildren. With the notable exceptions of First Nations people (who were already here when European immigrants came ashore) and Africans that were forcibly brought here in the slave trade, most of our forebearers came to the United States in search of a dream. An interesting point that often goes unmentioned in this debate is that had Native American tribes had the kind of strict immigration laws that the state of Arizona is advocating then many of us of European descent would not be here. Yeah, think about that for a second. While I have no problem with border states seeking to protect their borders, I am concerned about how Arizona's laws (and other states that may follow suit) will treat United States citizens with brown skin. Let's be honest here. Arizona did not pass their law because they are worried about German or Australian immigrants. It was passed to keep Mexicans out of the state who had not followed the proper channels to get into the country. By requiring people to produce immigration papers to local police at any time they are deemed suspicious, I simply see no way that this law will be carried out apart from racial profiling. These types of requirements are all too similar to how slaves had to have "passes" from their masters in the antebellum South or when black Africans had to carry paperwork with them anywhere they went under apartheid in South Africa. As a Christian, I cannot support any kind of law that encourages the harassment and/or imprisonment of any individual or family simply because of the color of their skin. Sadly, our country has a sordid history when it comes to how we've treated our citizens of color in matters of national security (e.g. see treatment of Japanese Americans during World War II). I'm not sure what the most effective method is to ensure that all people desiring to live in the United States go through the appropriate channels to do so, but I do hope those hoping to live here are afforded the same opportunities that my ancestors were given. As Rabbi Hirschfield stated, the privilege to live here does come with certain obligations and there are needed steps to make sure immigrants meet those obligations. But I would hate to see American citizens treated unfairly simply because of their country of origin. That, they say, is simply un-American. 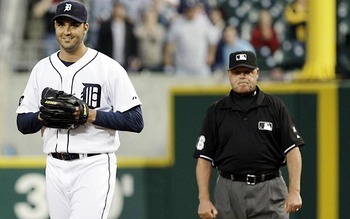 Even if you're not a baseball fan, you've likely heard about the near perfect game that Detroit Tigers pitcher Armando Galarraga threw last night against the Cleveland Indians at Comerica Park. For those of you that don't follow baseball, a perfect game is when a pitcher is able to pitch for nine innings without any opposing players reaching base safely. Nobody can get on base by getting a hit, earning a walk, due to an error, getting hit by a pitch or any other way. 27 up, 27 down. During last night's game, Galarraga had managed to get the first 26 batters out when he faced Indians shortstop Jason Donald with two outs in the ninth inning. Donald hit a weak grounder to Tigers first baseman Miguel Cabrera, who fielded the ball cleanly and flipped it to Galarraga for what appeared to be the game's final out and the completion of Major League Baseball's 21st perfect game. But veteran umpire Jim Joyce signaled that Donald had beat the throw and called him safe at first. Immediate replays showed that Cabrera's throw beat Donald by half a step and that he should have been called out. Although Tigers manager Jim Leyland and other teammates argued with Joyce, Galarraga turned away, smiled and proceeded to get the last out on the next hitter, Trevor Crowe. With what would have been the first perfect game in the history of the storied Detroit franchise, Galarraga could have been justifiably upset at Joyce. Few would have faulted him were he to have thrown a tantrum, kicked some dirt on Joyce and argued until he got thrown out of the game. But he didn't. He responded with grace and dignity and went back to work to finish the game. Having watched the replay after the game, Jim Joyce humbly admitted his error and expressed his remorse towards Galarraga. In a touching move this afternoon, Jim Leyland allowed Galarraga to take the Tigers lineup out to home plate before today's game before Cleveland. The umpire that he handed the card to? None other than Jim Joyce. Galarraga had accepted his apology and they shook hands as Joyce was visibly moved. In another nice gesture, General Motors, who has also taken their share of hits recently, presented Galarraga with a brand new Corvette for his pitching masterpiece. His display of class in choosing not to argue the call and in accepting Joyce's apology say much about the character of Armando Galarraga. He may not go down in the record books as having pitched a perfect game, but those of us that are Tiger fans will remember the perfect game he pitched and his perfect response to a difficult situation. "I wonder if perfect is overrated. Jim Joyce is showing great character in the midst of significant personal failure and Armando Galarraga is showing great character in the midst of significant personal loss. They are both currently way more fascinating and impressive than a perfect game." I couldn't agree more. It's unfortunate that Joyce will likely become known as the Bill Buckner of umpires and have a fine career tainted because of a single misjudgment in a moment of time. It took a big man to forgive and it took a big man to go back out on the field into a potentially hostile environment this afternoon. Thank you Armando for representing Detroit well and demonstrating what grace and forgiveness looks like and thank you to Jim Joyce for your display of humility in recognizing your mistake. I hope my fellow Detroit fans will be as quick to forgive Joyce as Galarraga has been. "Jesus's miracles in particular were never magic tricks, designed only to impress and coerce. You never see him say something like: "See that tree over there? Watch me make it burst into flames!" Instead, he used miraculous power to heal the sick, feed the hungry, and raise the dead. Why? We modern people think of miracles as the suspension of the natural order, but Jesus meant them to be the restoration of the natural order. The Bible tells us that God did not originally make the world to have disease, hunger, and death in it. Jesus has come to redeem where it is wrong and heal the world where it is broken. His miracles are not just proofs that he has power but also wonderful foretastes of what he is going to do with that power. Jesus's miracles are not just a challenge to our minds, but a promise to our hearts, that the world we all want is coming." I'm a follower of Jesus who believes that faith affects all areas of life. I work with Cru, a caring community passionate about connecting people to Jesus Christ, by serving alongside an emerging generation of ethnic minorities who are changing the world. The opinions expressed on this blog are Scott Crocker's and do not express the views or positions of Cru or Lake Baldwin Church. Please read my Comment Policy here. Crocker Chronicle by Scott Crocker is licensed under a Creative Commons Attribution-NonCommercial-ShareAlike 3.0 Unported License. Copyright © 2005-2018 Crocker Chronicle by Scott Crocker. Picture Window theme. Theme images by kickers. Powered by Blogger.